The bane of humanity, corrupted pokemon are feral beasts. They have been possessed by the spirit of Famin, a legendary pokemon who wants nothing more than to see the world burn. He is currently trapped in eternal battle with Arceus in the Orb of Serrin. To achieve his release, he has spread evil to the hearts of pokemon around the world. These pokemon are known as Corrupted Pokemon. Their only purpose in life has become to release their master, slay humans, and increase their numbers. They ruthlessly target humans whenever possible, and they relish in the thrill of the hunt. When they attack other pokemon, they possess the ability to spread their condition to the victims. There is no negotiating with these vicious monsters, and if you meet one prepare to fight, because you are about to enter into a deathmatch. Corrupted pokemon only gain half the exp they normally would. The capture rate of Corrupted Pokemon is 10 points lower than normal. If captured, Corrupted Pokemon have an unchangeable loyalty of 0. They will actively try to injure their trainer and break their ball when released. Corrupted Pokemon are unable to communicate in any way with any creature not another Corrupted Pokemon. When not in sunlight, a Corrupted Pokemon gets all combat stages raised two steps, when in daylight, they are lowered two steps. 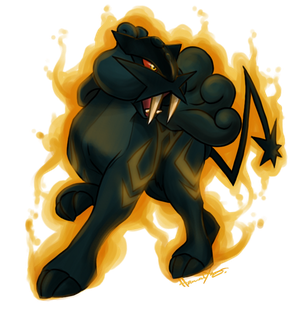 When a Corrupted Pokemon hits another pokemon with a damaging attack, there is a 1% chance of that pokemon turning into a Corrupted Pokemon over the next 2d4 days. A Corrupted Pokemon instinctualy knows if they have infected a target. There are two ways to stop a Corrupted Pokemon. The first, and most common way, is to kill the monster. The second is to attempt to purify it and turn it back into a normal pokemon. This can only be done by destroying the link of wild magic that connects them to Famin. Few people are capable of doing this - only legendaries or those blessed by legendaries are able to perform this action. Theoretically a powerful elementalist would possess the ability, but those people are rarer than the godtouched. Role in Aatos Corrupted pokemon are the minions of Famin, and are used by him to further his influence. They serve as monsters in need of hunting down. Even when not in Serrin, corrupted pokemon still appear, and talented trainers are needed to destroy them. Also, the more power these pokemon gain, the more likely they are to free their master. Common Locations For the most part, Corrupted Pokemon are incredibly rare. So rare that many places have no knowledge of corrupted pokemon or where they come from. If one does appear, they assume it has suffered some sort of disease, and put it down mercifully. Only in Serrin do these pokemon appear with any semblance of regularity, and even there sightings of the beasts are rare. They live in underground tunnels, many of which come up in the Shadukar forest of Serrin. This heavily wooded spot has been completely taken over by the corrupted pokemon, despite the Church of Arceus's several attempts to wipe them from the earth.